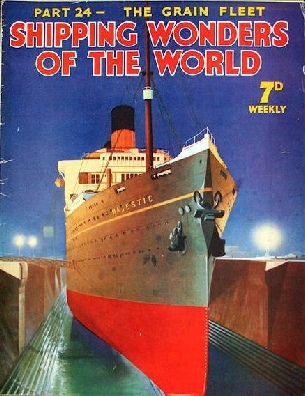 Part 24 of Shipping Wonders of the World was published on Tuesday 21st July 1936. It included a centre photogravure supplement featuring ships of the Mariehamn Grain Fleet, which formed part of the article on this fleet. The cover of this week’s Part of Shipping Wonders of the World shows the Majestic in dry dock. The Majestic was formerly the Bismarck and was built by Blohm and Voss, of Hamburg, in 1921. Her tonnage was 56,599 and her dimensions 915 ft 6 in by 100 ft 1 in by 58 ft 2 in. She was placed out of commission in February 1936. The entrances to many ports must be kept free from silt, and without the ugly but efficient dredgers and hoppers that keep the channels clear even the greatest ports might fall into disuse. There is nothing ornamental about the dredger, yet without her the passage of ships, whether sailing or steam, would often be impossible. To many great ports the dredger is an essential craft, especially to those ports which are situated some distance up a river. This chapter is by C Hamilton Ellis. The story of the salvage of the German High Seas Fleet, concluded from part 23. The cities of Amsterdam and Rotterdam are not only unusual and picturesque, but they are also vital centres of a great maritime nation and among the most active ports in Europe. This chapter is by A C Hardy and is the seventh article in the series on Great Ports of the World. In the nine hundred years from AD 600 to 1500 ships developed from the Viking galleys of the Scandinavian shores to the caravels of Columbus and other famous navigators. In many ways this period was the most adventurous in maritime history. Modern-day conditions for the crew are luxurious compared with those that prevailed in medieval times. Bad food, dishonesty and exposure to appalling weather constituted the lot of the sailor in those days; yet courage and determination, those qualities which are inseparable from the sea, overcame those difficulties. The sailors in those early ships helped to found a great tradition. This chapter is by Lieut.-Com. E Keble Chatterton. A sequel to this article appears in part 34. On the counters of most of the large sailing ships of the world appear the name of Mariehamn, a tiny port set in the Aland Islands of the Baltic Sea. Every year its famous vessels bring cargoes of wheat from Australia to England. The ships of the grain fleet are among the most interesting that have ever sailed the Seven Seas. Captain Gustaf Erikson of Finland is largely responsible for the continued existence of the famous grain fleet of sailing ships. This article is by W L A Derby. There are few occupations more perilous or more profitable than hunting for seals among the dangerous ice-floes of the North Atlantic. Many of the sturdy sealing-ships have been destroyed by the tremendous pressure of the moving ice. This article is by E E Mills-Joyce and is concluded in part 25. THE BEAUTY OF SWELLING CANVAS is seen in this striking photograph. 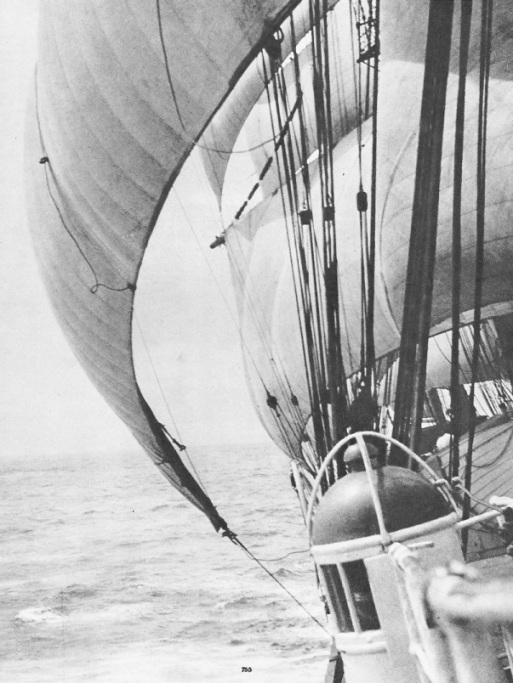 It was taken in 1933 from the lee side of the Herzogin Cecilie, through the perfect arch of the foresail. One of the largest vessels in the Mariehamn grain fleet, the Herzogin Cecilie, 3,111 tons gross, went ashore near Salcombe (Devon) in April 1936. The Herzogin Cecilie is also featured in an article in part 4. 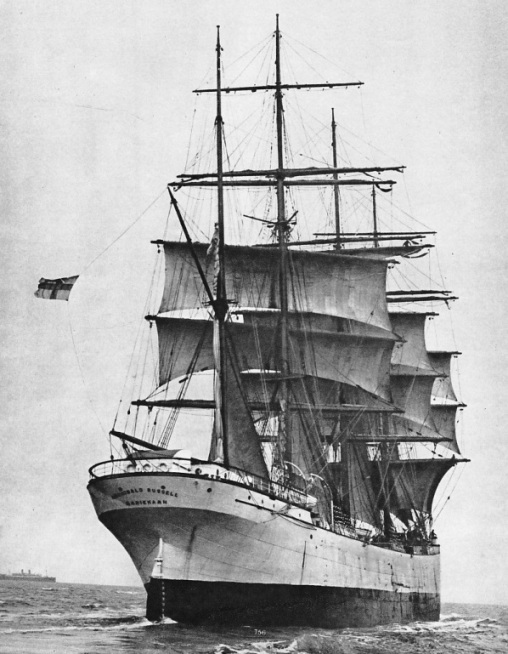 FLYING THE FINNISH FLAG, a blue cross of a white ground, the Archibald Russell makes the journey to Australia in ballast. 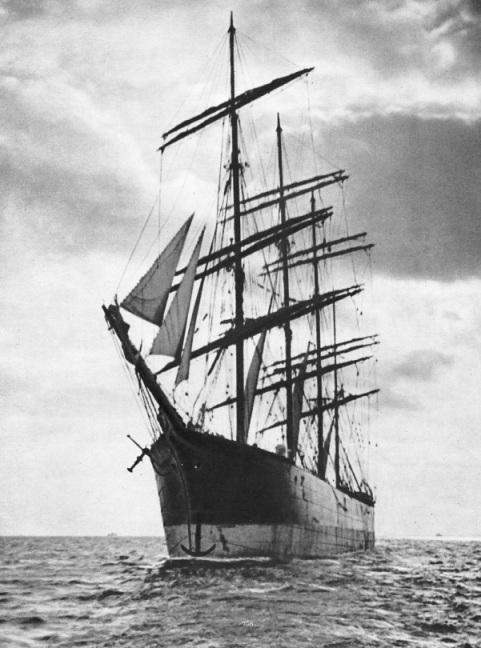 A steel four-masted barque of 2,354 tons gross, she was built at Greenock in 1905. She has a length of 291 ft 4 in, a beam of 42 ft 11 in, and a depth of 24 feet. LOADING WHEAT AT MELBOURNE. 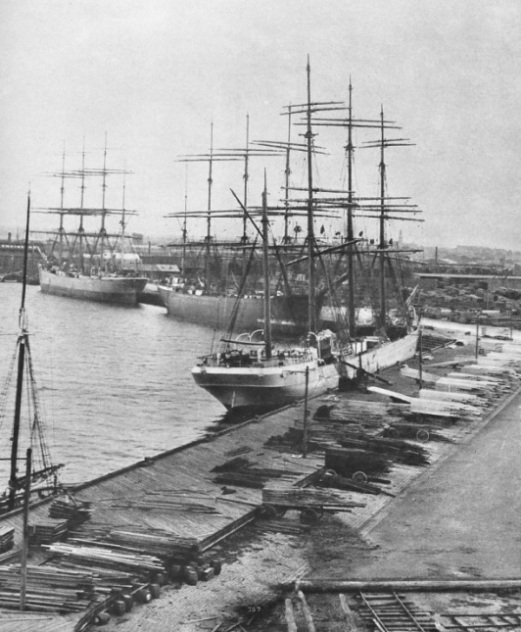 This photograph, taken on December 14, 1929, shows the four-masted barques Beatrice, 2,104 tons gross (in the foreground), Pommern (see below), and Melbourne, 2,691 tons gross. The Melbourne sank off the Fastnet Rock, south of Ireland, after collision with the oil-tanker Seminole on July 1, 1932. She was built at Port Glasgow in 1892. BOUND FOR MARIEHAMN, the Pommern, a steel four-masted barque of 2,376 tons gross, is seen in this photograph in the Thames estuary. The Pommern was built in 1903 by J Reid & Co Ltd, at Glasgow. She is 310 ft 7 in long and has a beam of 43 ft 5 in and a depth of 24 ft 6 in.